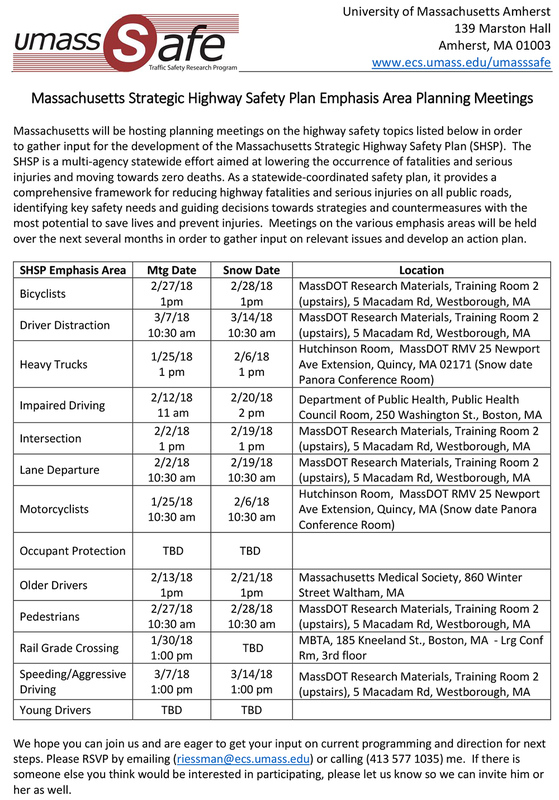 Massachusetts will be hosting planning meetings on the highway safety topics listed below in order to gather input for the development of the Massachusetts Strategic Highway Safety Plan (SHSP). The SHSP is a multi-agency statewide effort aimed at lowering the occurrence of fatalities and serious injuries and moving towards zero deaths. As a statewide-coordinated safety plan, it provides a comprehensive framework for reducing highway fatalities and serious injuries on all public roads, identifying key safety needs and guiding decisions towards strategies and countermeasures with the most potential to save lives and prevent injuries. Meetings on the various emphasis areas will be held over the next several months in order to gather input on relevant issues and develop an action plan.